How about some inspiring quotes from one of the biggest inspirations in the world? Read below to find 15+ motivational Robin Williams Movie Quotes (along with FREE printables to hang on walls) to boost your business skills and innovate your entrepreneur self. Or use it as ready to go tweets, quote images for your social media updates. Robin Williams or the man who arrived in our lives as an alien, but ended up touching every part of the human spirit (as addressed by President Obama on his death), is the one who taught us to live life larger than life itself. Robin Williams, the the kind of soul that never leaves you, though. He has sprinkled his form all over mankind through his work and his profound wisdom in the form of encouraging, motivating movie quotes. Want to create a money-making blog like this one? Starting a blog isn't as daunting as it seems. Click the button below to create a blog that makes money (I earn a living off my blogs including this one) in 7 easy-peasy steps. You don't have to know coding, neither any technical knowledge is needed. Click the button below to create a money-making blog for you. Apart from his outstanding films, Robin Williams’ quotes on life, sadness, laughter and motivation pretty much sum up his deep sagacity of life and emotions as a whole. Now being entrepreneurs, business owners and mostly work-from-home solopreneurs we often lose our mojo and life gets dull. I too have my fair share of gloomy, feeling-low days when everything seems blue for no reason. These gloomy days are the time when we require someone’s joyful, motivating words to bring us back on track. When it comes to motivation and inspiration, there’s no better an arena to look for than Robin Williams, who has made us laugh, cry, and soar with hope with his majestic movies like Good Will Hunting and Dead Poets Society. That’s why I thought of sharing some of the Best Robin Williams inspirational quotes that have helped me cheer up during low times. 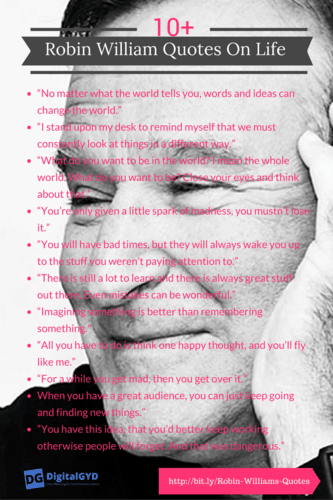 I hope these top Robin Williams Movie quotes (and elsewhere) give your entrepreneurial spirit the uplift it deserves. But, prior to that, Here are some facts about Robin Williams for my readers who need to know more about him. Robin Mclaurin Williams was born on July 21, 1951 and graduated from Redwood High School (north San Francisco) and was voted "least likely to be succeed” in high school. His favorite book was The lion, The Witch﻿﻿﻿ and The Wardrobe by C.S.Lewis. His film journey started with his disastrous movie Popeye (1980) but rose to winning the Academy awards for best supporting actor in Good Will Hunting. Williams got angry with Disney for using his voice as the Genie in Aladdin to sell merchandise for the movie because “I don’t want to sell stuff. It’s the one thing I won’t do,” he told New York magazine. Disney attempted to make up for it by sending him a Picasso painting, believed to be worth $1 million, in which the artist imagined himself as Vincent van Gogh (source). He appeared in 1﻿﻿03 movies and TV shows from 1997 to 2014. On August 11, 2014. 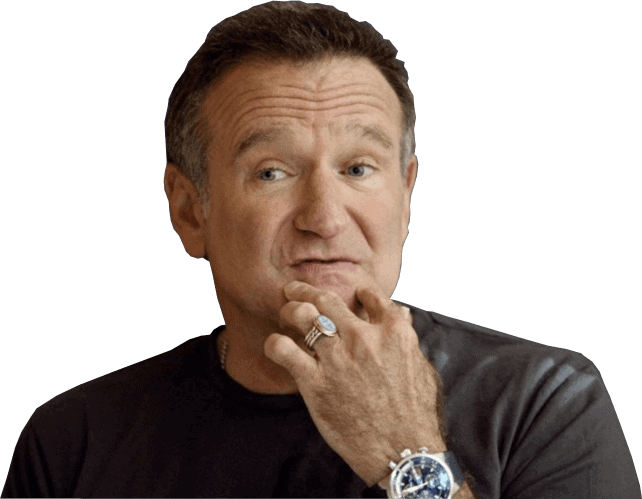 Robin lost his war with long-time depression and hanged himself. He was found dead in his California house. If you’re a work-at-home solopreneur or an entrepreneur who has a remote team you might know how it is to sit in front of the computer without uttering a single word, maybe for hours. These can sometimes cause serious depression and is not at all good for mental health. So, I have collected some of the most popular Robin Williams movie quotes about life, laughter and philosophy of rising up that will help you. And with this we come to the Robin Williams Quotes section that can raise your spirits and fill you with new courage to pursue your goals. ​So here are the quotes to lighten your mood and wade off the depression you get working online. These quotes will keep you inspired and motivated for your entrepreneurship journey. ​So, here are the quotes to lighten your mood and wade off the depression you get working online. These quotes will keep you inspired and motivated for your entrepreneurship journey. All the quotes below are pre-formatted as ready-to-tweet tweetables. Enjoy these, tweet them, send them to your buffer (or any other social media scheduling tool) so that it goes one every morning automagically! The above Robin Williams quotes are from his movie Good Will Hunting. Over To You: Loved The Best Robin Williams Movie Quotes 2018? 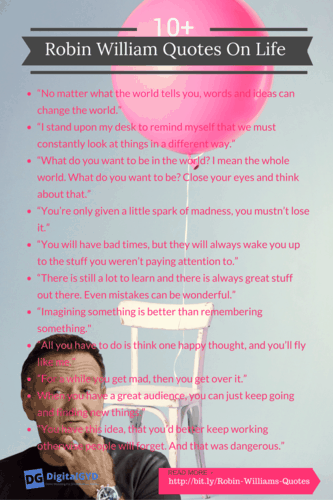 I have compiled this list of Robin Williams movie Quotes on laughter, about life and perhaps every other aspect of a quality living because I know how daunting working online can be. Being a freelancer or an online business owner is not as luxurious as it is thought of. We mostly work lonely and sometimes never get to meet someone for the whole day. While these quotes or wall hangings are not the only solution for all those, having positive things does make a difference. Along with these printables, you should make a habit to take regular breaks, get some family time, play with pets and take a walk daily to stay mentally and physically fit. How do you deal with online working burnouts? Do you try changing work locations like working from coffee shops etc? Amazing Article learned a lot from here and motivative article to inspire ourself!! Your Printable PDFs are Great. The 3rd One with Full Size Robin Willam Photo is the Best for Me. Motivational Source always give a Positive Thinking and Success. Glad to read your whole post! it is really very motivational and full of inspiration quotes of Robin William. I loved all the excellent quotes and they have great meaning. These are very helpful to motivate and take inspiration to enhance our experience for life. Eventually, thanks for reveling a light on this topic.